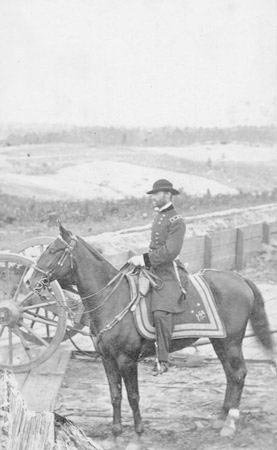 In this image Lieutenant General William T. Sherman (1820-1891) appears mounted on his horse Duke in Atlanta, Georgia during the Civil War. This 2.5 by 4-inch (6.35 by 10.16 cm) carte de visite dates from 1864. William Tecumseh Sherman was born in Lancaster, Ohio. Orphaned at age nine, he was raised by Thomas Ewing, a U. S. senator who also served as secretary of the treasury and secretary of the interior. He graduated sixth in his class from the United States Military Academy at West Point and served in positions in the South, where he gained great knowledge of the Southern people and the geography of the region. Sherman served in the Mexican War, but left the army in 1853. At the outbreak of the Civil War, he accepted a position as a colonel in the regular army. Sherman became well known for his tactics of property damage and psychological warfare against the southern people, best illustrated by his march through Georgia. His goal was to convince the Southern people to stop the war, and prevent more battlefield deaths. Sherman's military career continued after the Civil War. In 1869, President Ulysses S. Grant promoted Sherman to full general and commander of the United States army. Ohio Historical Society P 42, AL00545 from the Sherman Family Photographs Collection.